Well, the paddling season began for me on Saturday, 03-14-09. After going to the Health Club early in the morning, I drove down to Mississippi Point Park in Champlin on the Mississippi River. The skies were clear, but the temperature was 33 degrees. There was a strong southerly wind blowing, but I was sheltered by the shore line. I was in my C-1 (Crozier J-193) and went upstream. There was snow along the shore lines, the ducks were quacking and the geese were making their noise. Yes, I get tired of listening to the geese. I didn’t see any one else out paddling today. I enjoy the early season paddling because there aren’t any boats going up or down the river and there weren’t any jet-skis going in circles. I was only out for 1 hour and fifteen minutes. Afterwards I went for a 3 hours walk with my camera to Elm Creek Park and worked on my Intermediate Photography assignment. While I was out walking I received a phone call from Krista Madison in Grand Rapids. She wanted to make sure I got her e-mail about paddling in Grand Rapids on April 4th and 5th. Al Rudquist invites everyone to come up and paddle for about 6 hours on Saturday and a lesser amount on Sunday. When I got home I had another e-mail from Krista about the date for Al Rudquist and her about their new race this year. 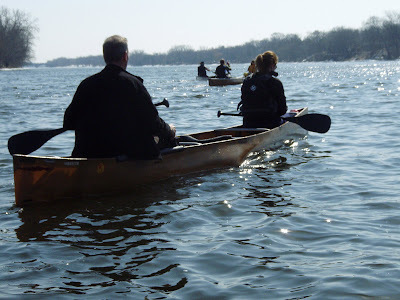 We are planning a Spring paddle weekend on April 4-5. 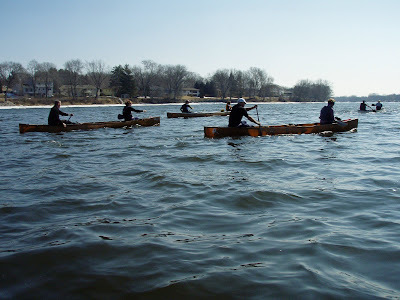 For those of you that haven't come before, we usually do a 6-hour paddle down the Mississippi on Saturday and then a shorter 3-4 hour paddle on Sunday. The idea is to get hours in the boat, and stay together - if some teams are faster they can circle back and get in extra mileage. We have room for people to sleep overnight Friday and/or Sat. Let us know if you are coming so we can have an idea what to expect - thanks, hope to see you! During the evening I went down to Mississippi Point Park and did my night photography assignment. In fact, I have to go out tomorrow night and finish it. I went to the Health Club again this morning. I did another one hour on the Life Fitness cross trainer. Afterwards I went home and changed into some paddling clothes. When I got down to Mississippi Point Park at 1015 am I saw Io Harberts parked in the lot. I parked my Suburban where I normally do and Io drove over and parked next to me. Io said the group was supposed to meet at 1030 am but some were calling her while we talked and said they were running late. I prepared my C-1 for today’s paddle as a couple cars were pulling into the lot. It was another sunny day and the temperature at the start was in the upper 30’s. I went up stream for one hour and twenty five minutes before turning around. Eventually I came across the other paddlers. There were 5 C-2’s in the group. 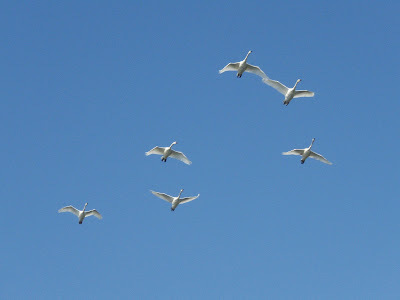 I think this was the first day for most of them so they decided to turn around and paddle back to the landing with me. I finished my day with two hours and 10 minutes of paddling. Once I got home I changed into my cycling clothes and pumped up the tires on my Mt. 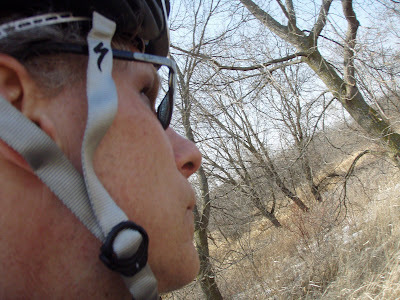 Bike to hit the trails through Elm Creek Park. 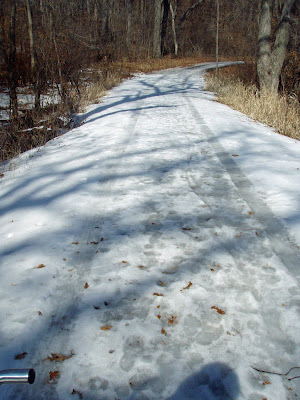 I didn’t go as far as I was planning to because there was still quite a bit of snow on many portions of the trail. I was just a couple days too early. Once I hit a road out of the park I decided just to ride back home. I was gone for 45 minutes. 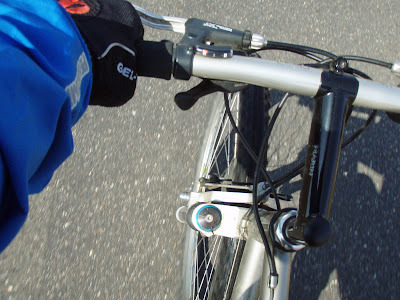 Since I haven’t done any cycling for a long time it was just as well that I ended early. I'm going to stop here and go finish my night photography assignment. I didn’t get home until 1000 pm last night so I didn’t get this post finished. Well, it was 64 degrees when I got off work today. I went down to the Mississippi River in Champlin and paddled for 1 hour and fifty-five minutes. I got off the water at 07:40 pm. There were many warm and cold pockets on the Mississippi.